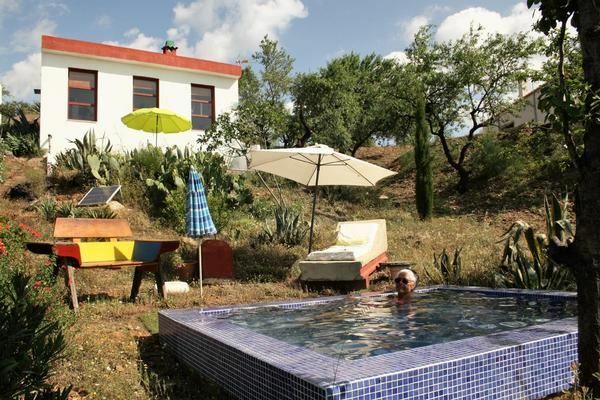 Entirely free in the mountains and 5 km, as the crow flies, from the Mediterranean Sea is our holidayhome "La Alcandora". a place to recharge your battery or to be creative. From the house you have a nice view upon the sea. For cooling there is the little pool ..
From here you can make nice walks. By car you can discover the beautiful white moorish villages of the Alpujarras of Granada at the foot of the Sierra Nevada and the lovely little seaside resorts at the beach. You can drive to the city of Granada by car in 1 1/2 hour. The Sierra Nevada is situated in the heart of Andalusia, is a paradise for all winter sports enthusiasts. Unbelievable but true: Only 1 1/2 hour away you can enjoy altitude ski fun on more than 3000 meters pur. More than 60 kilometres of pistes are open 6 months in the year. Next to this house is our farm with 5 ha of private land where you can relax. We have almonds, figs, olives, saffron and our own organic wine. We are living in the nearby village, Sorvilán, for 12 years now. - Internet: once per object Costs amounting to (optional). - Pet: once per pet Costs amounting to 10 EUR (optional).